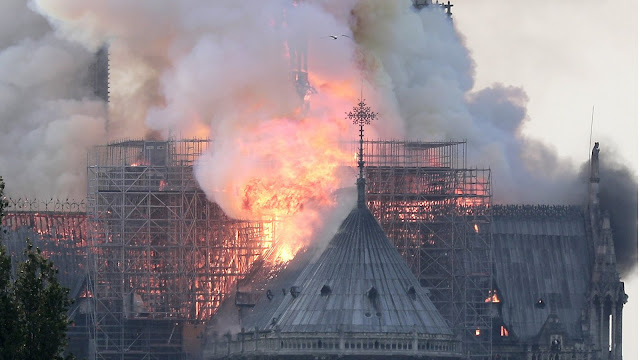 UPDATE: The fire at the Notre Dame Cathedral in Paris is now reportedly under control, and several key relics and pieces of art have been saved. A spokesman for the Paris police told CNN on Monday evening that responders have controlled the fire, which started earlier Monday and engulfed much of the building. Paris Mayor Anne Hidalgo also said in a tweet that "the Crown of Thorns, the Tunic of Saint Louis and several other major works" had been saved from the fire, according to CNN. "Thanks to the @PompiersParis, the police and the municipal agents the Crown of Thorns, the Tunic of Saint Louis and several other major works are now in a safe place," Hidalgo tweeted. It was not clear how many of the museum's other pieces of art were saved, CNN noted. Police said earlier Monday that Notre Dame had been saved from "total destruction" after authorities originally believed the fire might destroy the entire building. Authorities are investigating the cause of the fire. ORIGINAL POST: Paris' mayor said Monday that city firefighters are trying to control a “terrible" blaze at the Notre Dame Cathedral. The fire department in Paris said that a major operation was underway, Reuters reported. Smoke could be seen billowing out from the top of the cathedral in photos and videos shared online. President Trump tweeted that it was "horrible" to see Notre Dame in flames, and suggested using "flying water tankers" to attack the fire. The cathedral, which was built in the 13th century, is one of the most popular tourist destinations in Paris. It attracts more than 10 million visitors a year. Several prominent political figures expressed sadness on Twitter and shared their hopes that no one was hurt. "Notre Dame of Paris in flames. Emotion for a whole nation. Thoughts for all Catholics and for all French. Like all our countrymen, I'm sad tonight to see this part of us burn," French President Emmanuel Macron tweeted.